WMD | Corr Analytics Inc.
Journal of Political Risk, Vol. 1, No. 7, November 2013. 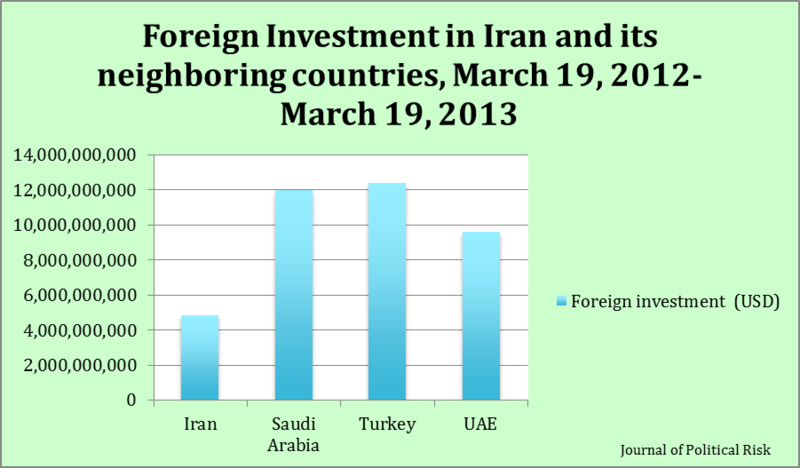 Figure 1: Foreign Investment in Iran and its Neighboring Countries, March 19, 2012-March 19, 2013. 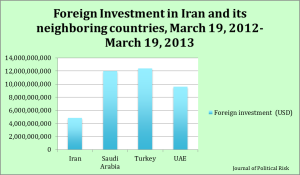 Data Source: The Government of the Islamic Republic of Iran News. Despite a tumultuous recent political history that includes revolution, war and sanctions, relations between Iran and the West are improving and Western investors are increasingly interested. But, Iran’s politics cause sanctions, and the economy suffers from inflation. Protectionist laws are on the books, and in some cases economic crimes are punishable by death. Regardless of warming relations with the West, Iran has in the past reneged on its agreements, and war is still a risk with non-Western bordering countries and regional powers. The Iranian Revolutionary Guard Corps (IRGC) has nationalized foreign investments in the recent past, and the politically powerful revolutionary foundations known as Bonyads control large segments of the most lucrative investment sectors. This entry was posted in Alliances, Consumer spending, Corruption, Foreign Direct Investment (FDI), Foreign Exchange Market, Inflation, Iran, Iraq, Israel, Law, Legislation, Middle East, Nationalization, Oil and Gas, Pakistan, Proliferation, Protectionism, Qualitative, Quantitative, Reform, Regulation, Sanctions, Shipping, Subsidies, UAE, United Kingdom, United States, WMD on November 24, 2013 by admin. A new Israeli-Palestinian peace initiative promoted by Secretary of State John Kerry today in Israel is unlikely to bear fruit, especially in the short-term. Secretary Kerry unveiled the plan, which is purposefully non-specific. It includes meager US-funded economic incentives, and a call for supporting the Arab League’s 2002 proposal for Israel to accept the pre-1967 border in exchange for recognition (WSJ). This entry was posted in Development, Middle East, Proliferation, Qualitative, Terrorism, United States, WMD and tagged Israel on April 9, 2013 by admin. Recent negotiations initiated by South Korea with the United States to obtain acquiescence for South Korean production of nuclear fuel show that South Korea is serious about improving its energy and security independence from the United States. Such moves are a response to growing public opinion pressure in South Korea, which perceives the need for a stronger and more independent counterweight to North Korean threats. Such steps in the fuel production cycle could eventually lead to an independent South Korean nuclear weapons capability (WSJ). This entry was posted in China, East Asia, Electoral Politics, Middle East, North Korea, Proliferation, Qualitative, South Korea, United States, WMD on April 3, 2013 by admin. The United States Treasury Department claimed on March 22 that it was confident that China would back new United Nations’ financial sanctions against North Korea. The sanctions punish North Korea for the nuclear tests of February 12. An anonymous Chinese official — almost certainly speaking at the direction of his government – on March 22 revealed that China halted oil exports to North Korea. Unfortunately, the pro forma Chinese punishment of North Korea for its most recent nuclear test will be intentionally lightweight. China had a similarly weak response to the first North Korean nuclear test on October 6, 2006, and it proved an insufficient disincentive to further nuclear and missile development. It increased backing to UN financial sanctions, and ceased oil exports to the country for a short period. As in 2006, China knows that Iran is likely to supply the energy shortfall to North Korea resulting from any loss from China’s embargo. Without a much stronger set of sanctions and enforcement mechanisms, a network of embargoed, rogue, and failed states have the outside option of trading with each other, and regaining overt Chinese and Russian support when international attention fades. Anything more than a slap on North Korea’s wrist would chill Chinese relations with authoritarian regimes across the globe. For this reason, China can ill-afford any drastic action against North Korea. China is a long-time supporter of authoritarian governments worldwide, from Uzbekistan to Syria. This support is concretized in the Shanghai Cooperation Organization. China is the key diplomatic supporter of North Korea, and can dictate many North Korean policies based on China’s economic power and physical proximity. Other authoritarian states will watch the magnitude of Chinese reaction to North Korean behavior to calibrate the trust they can place in their own relations with China. These global relations between China and authoritarian regimes are crucial for China to obtain relatively inexpensive raw commodity imports that fuel its present top priority of economic growth. It is inconceivable that China would risk slowing its own economic growth because of a recent uptick in threats to the West from North Korea. Short-term sanctions, however, will occur. China believes the young Kim Jong-Un, the new leader of North Korea, has overstepped his bounds with recent tests and threats towards the United States and South Korea. The increased Chinese support to sanctions and a decrease in North Korea’s access to oil markets serve China as both a message to Kim Jong-Un to follow a slightly quieter path, and a tool to stave off criticism of China at the United Nations were it not to support sanctions. Time is currently on the side of China and North Korea, leading to a trend of which China is well aware. China’s economy is growing much more rapidly than Western-allied economies, which strengthens China’s military and diplomatic position with respect to the West. North Korea continues tests of its nuclear and missile technology, with no effective response from the West. With the latest sanctions, China is telling North Korea not to rock the boat because the race is being won. Watch for China’s long and short-term strategies to have an immediate effect on Kim Jong-Un by decreasing his public belligerence. Also watch for China to ease pressure on North Korea as soon as it either complies or public attention goes elsewhere. Without a Chinese-supported embargo on imports and exports to North Korea, plus enforcement by international naval vessels deployed to the East China Sea and Sea of Japan, the latest round of financial and oil restrictions will be ineffective; North Korea will continue to progress in developing and proliferating nuclear weapons and missile technology. This entry was posted in China, East Asia, North Korea, South Korea, United States, WMD on March 30, 2013 by admin. Today North Korea put their medium-range missiles on combat alert and repeated threats against US military bases including in South Korea, Guam, and Hawaii. The US Defense Department sent a strong signal by flying two nuclear-capable B-2 Stealth Bombers over South Korea in training exercises, and through comments to the press by the Defense Secretary that indicate a readiness for conflict should that be necessary. A Defense Department spokesman softened those comments by reiterated that the US seeks to deescalate tensions, and that the important goal is to stay ahead of North Korea in terms of its capability to marry a nuclear warhead with a missile delivery vehicle (CNN). However, a potentially greater threat from North Korea is an unconventional or terrorist delivery of nuclear or other weapons of mass destruction (WMD). Were a nuclear device to explode in a major port city, for example, it would likely cause up to one trillion dollars of damages, 500,000 deaths, and $40-70 billion in trade losses (Bloomberg. Congressional Research Service). It is unlikely that the North Koreans would follow-through on their most recent threats, and unlikely that were they to try, a missile strike would be effective. The North Koreans are having difficulty with the technical challenges of component miniaturization that would allow them to place a nuclear warhead on a missile. To stave off such an attack in the future, the US must nevertheless maintain robust intelligence, deterrent, and preemptive strike capabilities. North Korea could provide us with an unpleasant surprise. Saddam Hussein surprised the world in 1990 with the progress he had made towards achieving nuclear status, and there is much more technological improvement in rogue state nuclear capabilities twenty years later. China and Russia are likely sharing, to a limited extent, nuclear technologies with Pakistan, Iran, and North Korea. These rogue states are likely sharing with each other as well. This sharing does not necessarily have to be state-sanctioned. A poorly-supervised agency within a rogue state would have the capability to proliferate nuclear or other WMD technologies without the knowledge of its government. Many individual scientists or government officials in these corrupt countries, if offered sufficient incentive, would likely be willing to share technological expertise or hardware necessary for the making of blueprints or reverse-engineering. The risk is not only that North Korea has a nuclear delivery capability about which we are unaware, but that they could be considering unconventional approaches to delivery. These approaches could include smuggling a nuclear weapon into the United States, Japan, or South Korea. Radiation detection used on all containerized cargo coming into the United States does not effectively detect nuclear materials encased in lead. X-ray scanning, which might detect such encased materials, is only used on 4% of the highest-risk cargo inbound to the United States. The Department of Homeland Security has found it impractical to implement a 2007 Congressional mandate to scan 100% of incoming containerized cargo (Bloomberg). Implementation of scanning and detection technologies is currently insufficient to guard against nuclear terrorists or rogue states that use containerized cargo as a delivery vehicle. North Korea could also simply drive nuclear materials and components across the Canadian or Mexican borders, or smuggle them on fast boats from a nearby Latin American country. Such components can be reassembled once in the United States. Finally, North Korea is in a unique position to use biological weapons of mass destruction. Often referred to as a hermit kingdom, North Korea has the world’s strictest restrictions on immigration and emigration. This makes them relatively invulnerable to blowback from a biological WMD. The most dangerous biological weapons are highly contagious. Contagion through humans is the delivery vehicle. Thus a strong disincentive for use of biological weapons by non-secluded states is the danger that the contagion will spread to one’s own country. This applies to a much lesser degree for North Korea. Biological weapons have the advantage over nuclear weapons in that they cannot be detected by radiation detectors or x-ray scanners, can be produced by small teams of bio-chemists with relatively ordinary lab equipment, and would be easily smuggled in containerized cargo. North Korea certainly has the capability to construct such weapons, and Defense Secretary Rumsfeld’s “unknown unknowns” applies. Finally, unconventional delivery of WMD has the advantage over missile delivery for North Korea in that its origin is less traceable. The United States came close to a preemptive strike against North Korean nuclear capabilities in the 1990s. While there are certainly risks of retaliation against regional US bases and allies, such a strike is still on the table as a policy option. It could have a salutary demonstration effect for other rogue states and proliferators, including Iran and Pakistan. The option of waiting, and continued technological development by a belligerant and immature North Korea, could make it impossible to take such actions in the future. This entry was posted in China, East Asia, Japan, North Korea, Pakistan, Proliferation, Qualitative, South Korea, Terrorism, United States, WMD on March 29, 2013 by admin. Gallup opinion polls conducted following North Korea’s third nuclear weapons test found that approximately 64% to 66.5% of South Koreans believe South Korea should develop an independent nuclear weapons capability. They want the capability to defend against North Korea if the United States unexpectedly withdraws its security commitment to South Korea (New York Times). The United States is fully committed to the defense of South Korea, and North Korea is well aware of this fact. For this reason, South Koreans should not be overly concerned with the latest North Korean antics. The United States stands firmly with its ally South Korea. Nevertheless, South Koreans are understandably uncomfortable having an unpredictable and highly belligerent nuclear-armed neighbor to the North. South Korean nuclearization would be a major blow to nonproliferation of weapons of mass destruction (WMD). The nonproliferation regime works because member countries show self-restraint by not developing independent nuclear weapons. Rather, they entrust their defense to a close security partnership with the United States, NATO, and other friendly alliances. If the strength of the alliance is not apparent to the voting population of a non-nuclear country — in this case South Korea — then it is incumbent upon the stronger member of the alliance to take greater measures to display that commitment. These measures should include improved specification of treaty obligations, greater numbers and quality of forces deployed to South Korea, higher levels of South Korean inclusion and diplomatic collaboration in U.S. foreign policy decision-making, and improved diplomatic relations overall through improved trade relations. Deepening all facets of the relationship between South Korea and the United States will enhance the trust required for South Koreans to place the security of their nation in the hands of the United States. Not taking proactive measures to improve the trust of South Koreans in the United States risks nuclearization of South Korea, which by example, will exponentially increase the risk of further global WMD proliferation. South Korea is a highly respected member of the international community. South Korean nuclearization will erode the taboo against proliferation, making it seem a respectable option for many small and medium-sized nations. We cannot afford the increased risk of nuclear war that this entails. This entry was posted in East Asia, Global, North Korea, Proliferation, Qualitative, South Korea, Surveys, United States, WMD on March 12, 2013 by admin.